I'm pretty sure most people have seen or experienced it when someone comments on a blog about the pictures or something, completely missing the point of the post because they clearly have not read it. Commenting on someones blog is a great way to share positivity and feedback but also it helps to get your own blog noticed. You leave your link and people check out who it is that has left the lovely comment, and vwallah you have managed have increased your page views and maybe even your following if you are lucky. But getting a comment that clearly shows someone has not read your post I think has the complete opposite effect, I personally would be less inclined to look at that persons blog or even reply to the comment because lets face it, its just rude really isn't it and just highlights their aim of gaining followers. Bit of a use and abuse, kick in the face feeling, that no-one deserves when they have worked hard on a post. So you have been drawn in enough (by a picture most likely) to actually click on the link to a post. If the pictures have captured your attention who is to say you won't enjoy the writing. It's not a secret concept that people want their blog to be viewed so they aren't going to post rubbish. I'm sure everyone has probably gone on a blog and just decided it's not for them and that is fair enough. But you should give it a chance because for all you know it could really be great content that you would love, but without reading and trying it you will never know. I think it is definitely a high point of the fashion, beauty, lifestyle blogger community but I'm sure its the same for other bloggers, that people tend to stick together. You almost make a little friendship group of bloggers that all look, like, share, comment on one another's blogs and social media. And it acts as like moral support, a little fan base that always there to make you feel like you post was successful. Reading the post and having a comment that reflects this not only brings you one step closer to broadening you 'fan base' of bloggers but shows your support of the blog you are on. So be nice and just give a lil' moral support sometimes. Most blog posts offer some form of advice, it could be step by step instructions on how to add something to your blog, a review of a product or styling options, as I often do in my 5 Ways to Wear posts. But sometimes hidden in the writing is a simple comment about maybe the length of a dress for example, which could make a particularly tall long legged person reconsider going through with the purchase they were about to make based on the pictures they have just seen. You never know what someone is going to say, it could be pros or cons of a product that would sway your thoughts about it. Reading through what they have to say could end up saving you the £3 you spent on postage ordering the dress that is too short that you now need to send back. Get ideas for your own. Honestly who doesn't take inspo from their favourite celebs and its the same with bloggers. I find myself going round and looking at loads of blogs for inspiration on all manner of things - style, blog layout, writing, post ideas - and its great. But most of the time that does require reading their posts to get an idea of that person and see if whatever you are taking inspo for will work for you. Help to grow you audience. 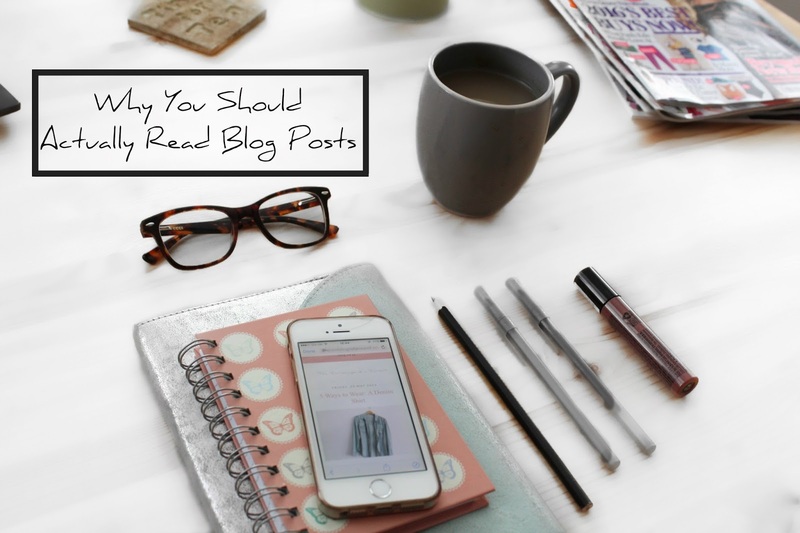 People want to see what their favourite bloggers are reading and looking at. On Bloglovin with the new save or love buttons its a way that allows people to know what you are reading, what bloggers you like and whats posts you have found helpful or enjoyable. This basically allows people to get to know and your interests which is essentially giving potential followers something more to look at on your profile and therefore making yourself more desirable to follow. Obviously this requires reading the post because you don't want to make the mistake of saving something that appears to be one thing but actually is completely different to what you thought it was and therefore doesn't actually reflect you as a person. So all in all, don't just look at the pictures, read the actual content. It could help you in more ways than you think! Have you ever experienced the 'clearly not read' comment? What makes you stick to reading the entire content of someones post? I think we have all had at least one of those comments, the worst one for me was after talking about being in hospital and someone commented something like "Great post, I love your hair!" It is never going to make me want to click on their profile, and kinda makes them look a bit silly! Whereas I would be more likely to engage with/read/follow the blogger if I got a nice comment. Anyway, I read all of this, so you must be doing something right!